September | 2015 | Wow, love that recipe! 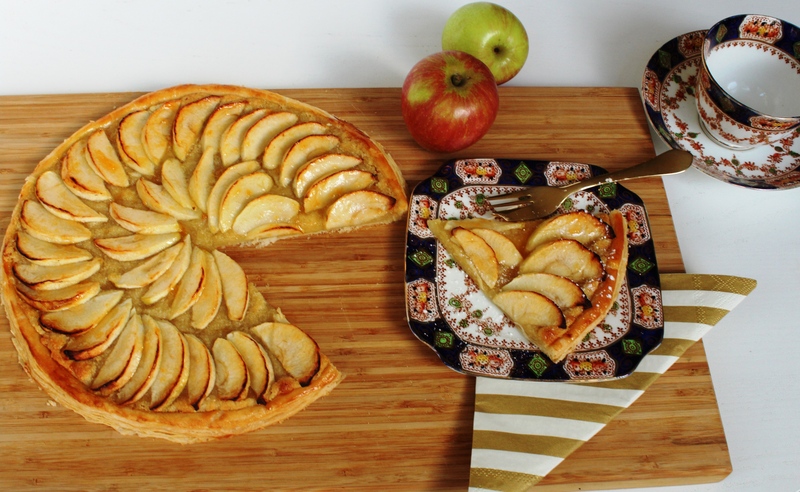 I made this apple tart as soon as I got home after buying the cooking magazine, ‘Olive’, October, 2015. Since apples are in their prime and I happened to have a bowl of homegrown ones, I thought this would be the perfect opportunity to use them. The recipe itself couldn’t be easier to follow. 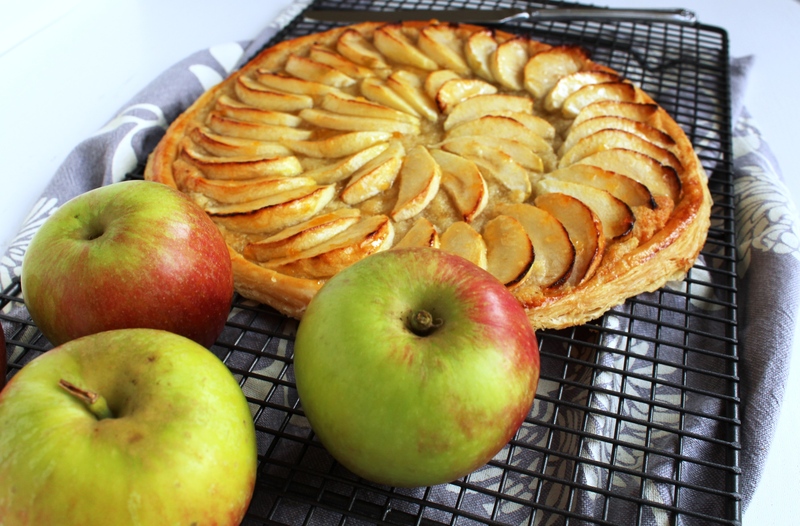 I was really pleased about how this came out, but if I were to make it again, I would sprinkle the apples with cinnamon and add some sultanas, artistically, of course. Heat the oven to 190°C/ fan 170°C/ gas 5. Roll out the pastry to the thickness of a 20p piece and use a plate approx 25cm in diameter to cut around with a knife. Transfer the pastry to a baking sheet. Gently mark a border approx 1cm from the edge. Don’t cut all the way through the pastry. Mix the butter, ground almonds and the sugar to make the frangipane. Spread a thin layer over the pastry within the border using a palette knife. Peel and core the apples, then slice them thinly. Toss in lemon juice to stop them browning. 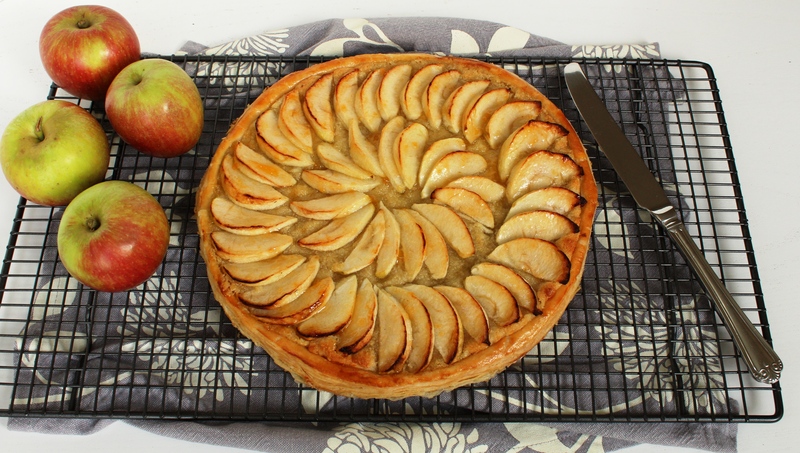 Arrange the apples over the frangipane. Brush the border with the beaten egg. Gently knock up the edges of the pastry with a sharp knife by loosening the pastry layers so they rise more. Heat the apricot jam and water in a small pan until runny then sieve. Brush over the apples while still warm. 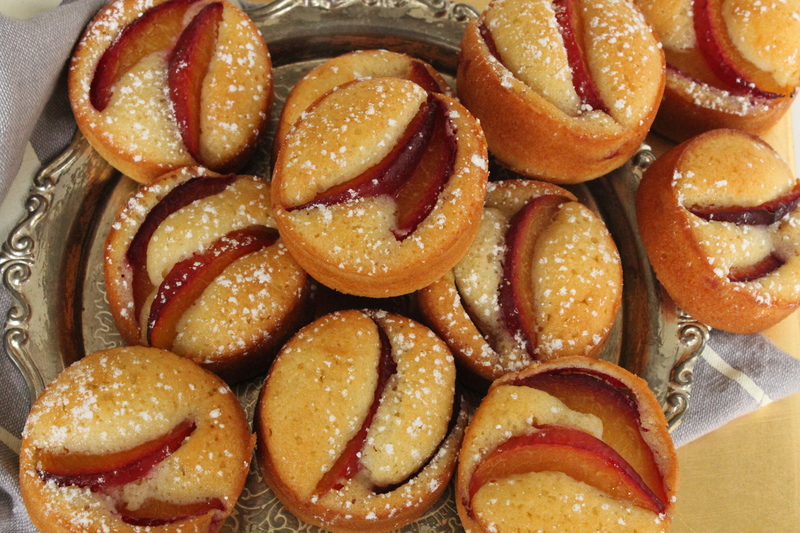 Friands are small French cakes which apparently are hugely popular in Australia. I get really excited when I make things which are so easy, look really impressive and taste delicious. I can’t wait to tell everyone! These cakes are divine and so quick to make, they can be on the table within the hour and eaten even faster! I’m really trying hard not to be greedy, but with such temptation, it’s very difficult! 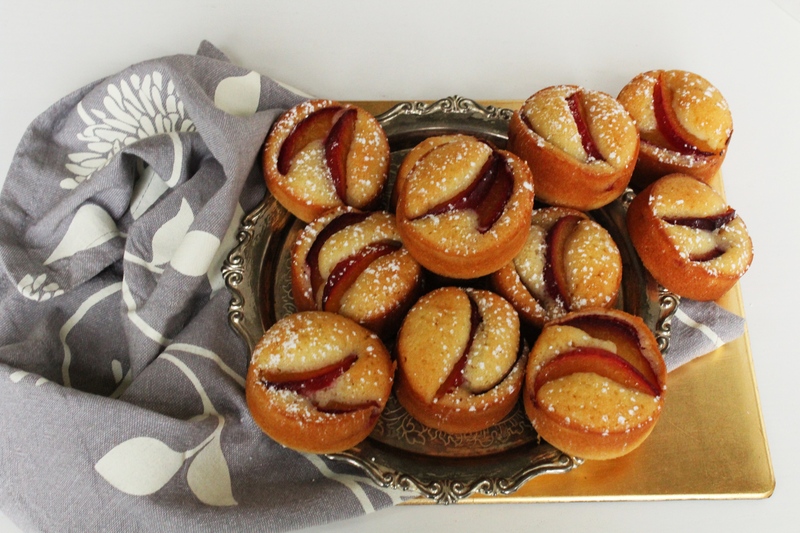 I think the plum on the top of the cake makes a great transition into autumn. It has a lovely tang in contrast to the sweetness of the cake. I also think these would make a great present, I mean who wouldn’t be thrilled to receive a box of these? Preheat oven to 200°C/180°C fan/ gas Mark 6. Grease a 12-hole muffin tin with a little butter, then line the bases with circles of baking parchment. Sift the flour and icing sugar into a bowl and add the ground almonds. Whisk the egg whites until soft peaks form. Stir the almond extract and melted butter into the flour mixture and mix to combine. Using a large metal spoon, fold a quarter of the egg whites into the flour and butter mixture to lighten it, then fold in the remainder until it is just combined. Divide the mixture into the holes in the tins. Arrange the plums on the top and bake for 15-18 minutes. Leave in the tin for 5 minutes, then loosen the edges with a knife and transfer to a wire rack to cool. Serve lightly dusted with icing sugar. Ok, so after all the madeleines I ate, here is the recipe for a really good salad. I actually eat a lot of salad in order to balance out the number of cakes! I had this salad just on its own as the tortillas make it fairly substantial but my partner had it with a piece of salmon. I’m not usually a fan of sweet corn, but this corn of the cob was sweet and crunchy, nothing like the tinned stuff. I loved the avocado, but the surprise star of this dish was the cashew nut cream. I used a red chilli in mine as I didn’t have a green one. The kale made me feel very virtuous before the melted cheese brought me back to reality. According to the recipe information, this salad has 500 calories per serving, just in case you are counting! You can find the original recipe in Sainsbury Magazine, August 2015. Preheat the oven to 220°C/Fan 200°C/ Gas Mark 7. Fill and boil a kettle. Put the cashews into a bowl, cover with boiling water and set aside. Stack tortillas and cut them in half, then into quarters, then into eighths, to make the tortilla shapes. Put them onto a large baking tray, making sure they don’t overlap too much, then drizzle with 2 tablespoons of oil and sprinkle with salt, pepper and smoked paprika. Toss to coat evenly. Remove any tough stems from the kale. Spread it out on another large baking tray, grate over the zest of one of the limes, drizzle over the remaining oil, sprinkle with salt and pepper. 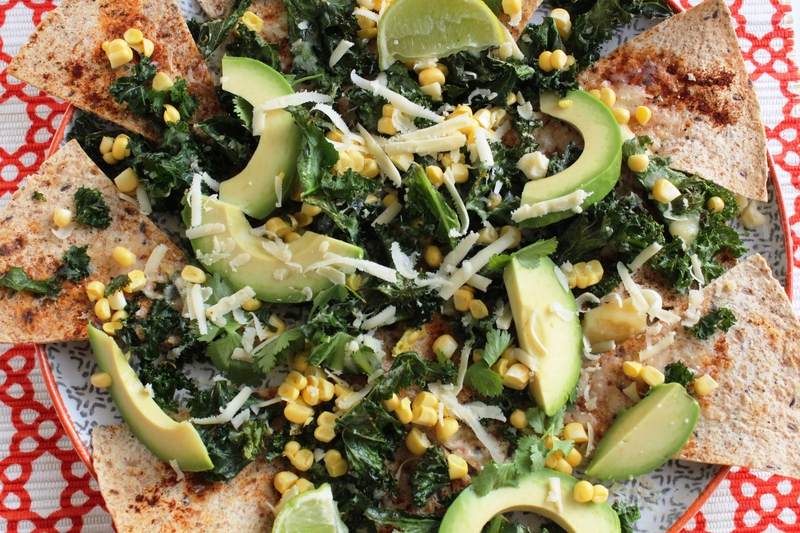 Put both trays in the oven for 10-15 minutes until the kale is crisp and the tortillas are browned. Meanwhile, make the cashew cream. Drain the cashews and put them into the blender with the juice of the zested lime and a good pinch of salt. Roughly chop the chillies and add to the blender with the coriander stalks. Pour in 125ml water and blitz on high for 2 minutes to a smooth cream. Taste; add more salt and lime juice if it needs it. Cut the kernels from the cobs of corn with a sharp knife – rest it in a mixing bowl to do this. Stone and slice the avocado and squeeze over half the remaining lime juice. Preheat the grill to high. 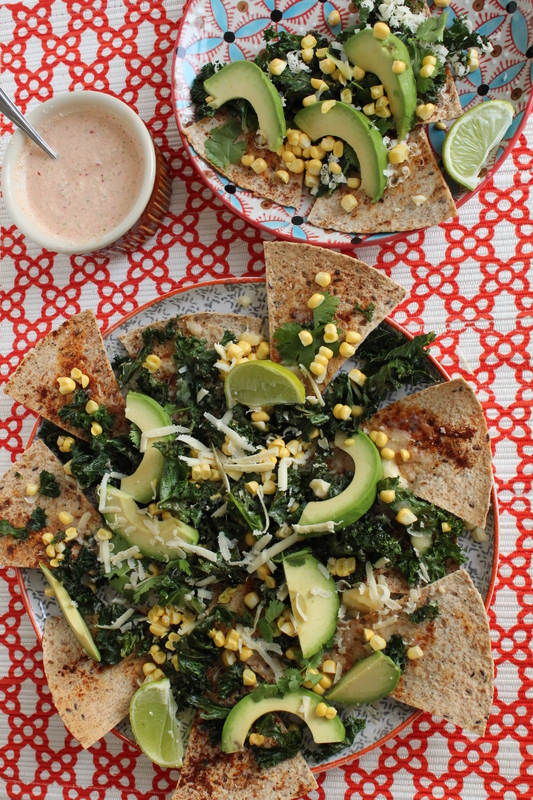 On your heatproof serving platter, scatter the crispy kale over the tortilla chips and grate over the cheese. Grill for 1-2 minutes until the cheese is beginning to bubble. Spoon on the cashew cream, scatter over the avocado, corn and coriander leaves. Serve with extra lime wedges. 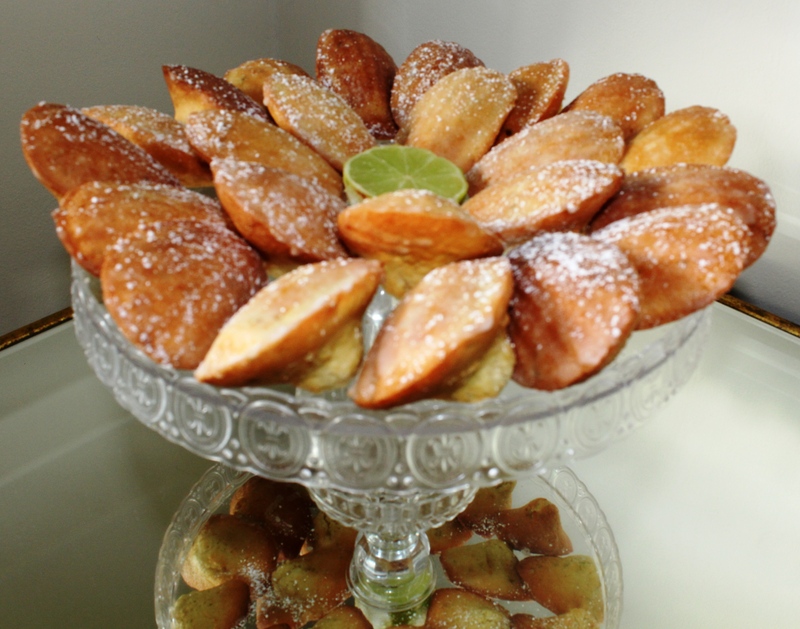 Madeleines, those cute little, shell- like French cakes are currently my new obsession. 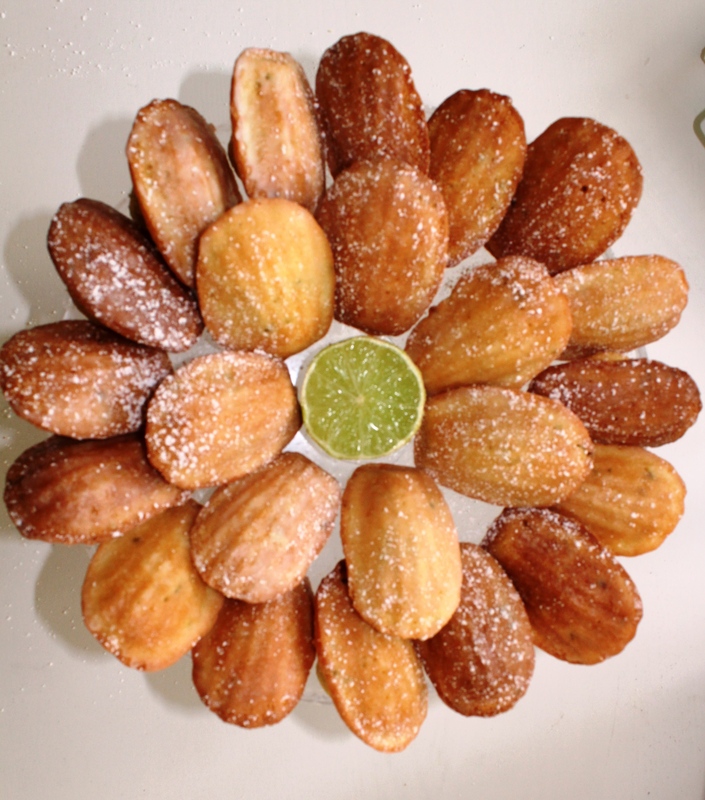 It all started with a half price madeleine tin (who could resist?). Next came the search for the perfect recipe which I found courtesy of David Lebovitz (www.davidlebovitz.com). Last year I read his book, ‘The Sweet Life in Paris’, about his life cooking in Paris, so I knew I was onto a good thing. It was there I learned about the hump! Apparently, any decent madeleine needs one. I also learned that for the best results, you should put the greased and floured baking tray in the freezer and refrigerate the batter for at least an hour. I’ve stayed true to David’s basic recipe, but I’ve adapted it with the lime and coconut. I was really pleased with how they came out, but I’ve eaten so many that I think my next post may have to be a salad! 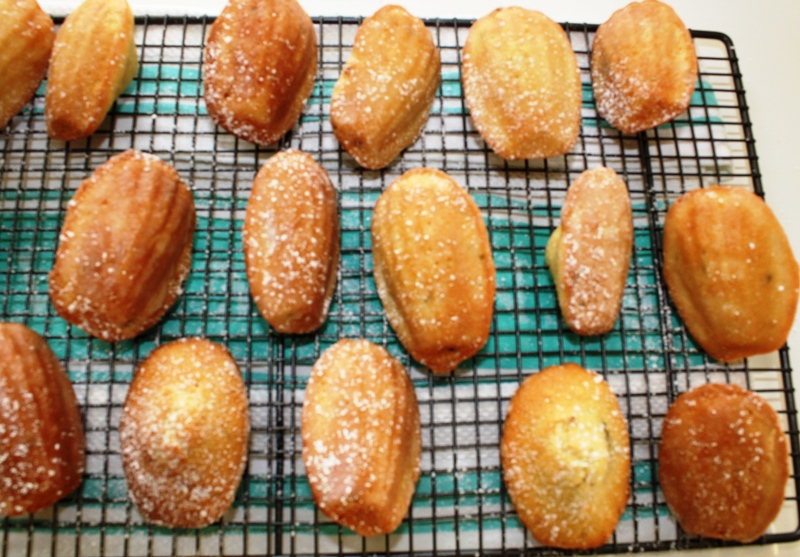 Brush the indentations of the madeleine mould with melted butter. Dust with flour and tap off any excess and place the mould in the freezer. In the bowl of an electric mixer, whip the eggs, granulated sugar and salt for 5 minutes until frothy and thickened. Spoon the flour and baking powder into a sieve and use a spatula to fold in the flour mixture as you sift it over the batter. Add the lime zest and coconut to the mixture and fold until incorporated. Add the melted butter a few spoonfuls at a time while simultaneously folding to incorporate the butter. Spoon the batter to ¾ fill each mould. Don’t spread the mixture. Bake for 8-9 minutes until the cakes feel set. While the cakes are baking, make the glaze by mixing the icing sugar and lime juice until smooth. 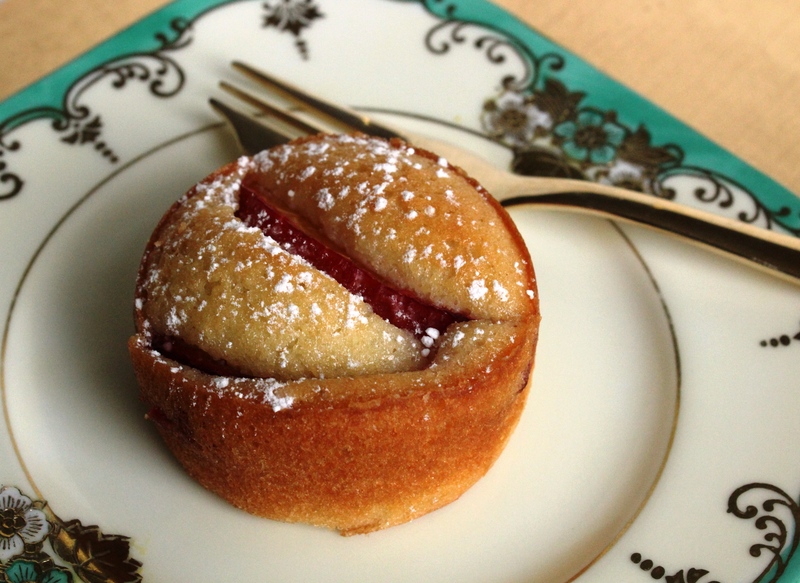 Remove the madeleines from the oven. When they are cool, brush on the glaze with a pastry brush. When the glaze is dry, lightly dust with icing sugar.